1896-1899: A new exciting era at Liverpool - LFChistory - Stats galore for Liverpool FC! LFChistory's series on the formative years of Liverpool FC, began with John Houlding's split from Everton that gave birth to Liverpool. Part two detailed the club's first ever season that ended in highly controversial circumstances when Liverpool faced Everton for the first time. Liverpool managed to reach 1st division after two successful seasons, but struggled to stay in the top flight, rocking between 1st and 2nd division. Parts 1-3 are linked in the right hand corner of this screen. John McKenna retired to the boardroom after Liverpool won the 2nd division in the 1895-96 season as Liverpool pulled off a masterstroke by convincing the best manager in the country, Tom Watson, to leave Sunderland and join the Anfield brigade in July 1896. Despite being so young the 37-year-old Watson had already won the First Division championship 3 times in 4 seasons at Sunderland in 1892, 1893 and 1895, being runners-up in 1894, as well as reaching the FA Cup Semi-final three times. Liverpool put together a handsome financial package for Watson as just one year ago Sunderland had won their third title under his rule while Liverpool had been relegated to 2nd division! A correspondent at The Sheffield & Rotherham Independent wrote on 31st August: "Mr Tom Watson has had a few presentations from his Sunderland friends, and he said at the presentation that he owed a great deal to the Press. He prides himself that he is now receiving the biggest salary of any football secretary." Watson's annual salary was said to be 300 pounds, doubling what he had at Sunderland. Liverpool’s game vs. The Wednesday on 1st of September 1896 was not only the first game Liverpool played under new management but also as Liverpool Daily Post reported: “The first game in new red shirts and white pants.” Liverpool had until then played in blue and white. Though Liverpool were sporting a new look, a few familiar faces were still in their ranks. 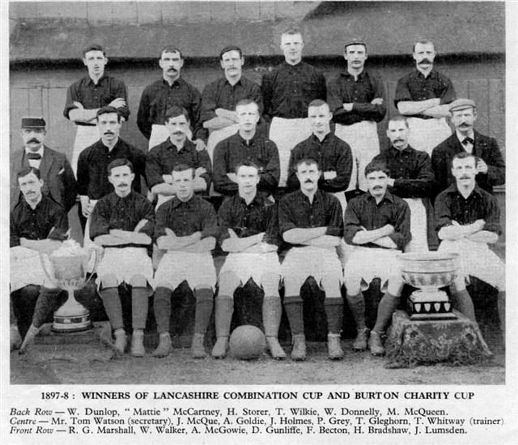 Matt McQueen, Joe McQue, John McCartney and Malcolm McVean also featured for the club in its first season in the Lancashire league in 1892. Liverpool were no longer called "The Blue and White", but "The Reds". George Allan, who had scored 28 goals in 26 games in his first season at Liverpool, picked up where he left off in the 2nd division and scored Liverpool's both goals in a 2-1 opening day victory over The Wednesday. The optimism raised by playing under such an accomplished team manager as Tom Watson faded a bit as Liverpool lost the next two games. However, Liverpool won the next two and the club was clearly better equipped under Watson to face the dangers of the first division. On 9th September 1896 Liverpool Echo reported also on a big change to the city's scene with the use of automobiles on its streets! : "The Act permitting the use of auto-cars is to come into force in the month of November, and the extent of the development of the use of such vehicles is difficult to foresee. An engineer of eminence, Mr Beaumont, is this afternoon to address the Chamber of Commerce of Liverpool on the possibilities of the adaptation of motorcar to heavy traffic. The question is one of the supreme interest to this port, situated as it is as a point of distribution of the world's merchandise." The first Merseyside derby of the season was equally awaited with great anticipation. Goodison Park was the venue on 3rd of October: "At an early hour the streets tending towards the scene of combat presented an animated appearance, and as the time appointed for the commencement of hostilities drew near the thoroughfares simply swarmed with pedestrian and vehicular traffic to such an unusual extent that even the most casual observer must have inferred some extraordinary event." Everton dominated the first half, leading 2-0 at half-time. Ross decreased the margin by one goal after a magnificent sprint, but Everton were victorious. All eyes were fixed on Liverpool when they visited Tom Watson's former club, Sunderland, at Newcastle Road on 17th of October 1896. Liverpool were 3-0 down at half-time to the home crowd's great satisfaction. Liverpool made much better account of themselves in the second half and scored twice in the last two minutes to reduce the loss to 3-4. "The Reds" as Liverpool were now commonly known since changing the color of their shirts won two and drew one until the return game against Sunderland took place at Anfield on 7th of November 1896 when "as in majority of the home games this year, the weather was simply wretched, and in addition to the drizzling downpour a murky mist overspread the enclosure, and shrouded the players in a veil of mystery, which threatened at one period to bring the game to an abrupt termination." Despite the ground being in a "sodden and saturated state", Liverpool were "wonderfully clever" and ran out 3-0 winners. Liverpool had reached the top of the 1st division with 16 points, but only temporarily as other teams had on average played three games less. Sunderland were badly shaken by Watson's departure and took a dramatic tumble down the 1st division table, finishing second to bottom. David Hannah scoring against Sunderland in the 3-0 win. 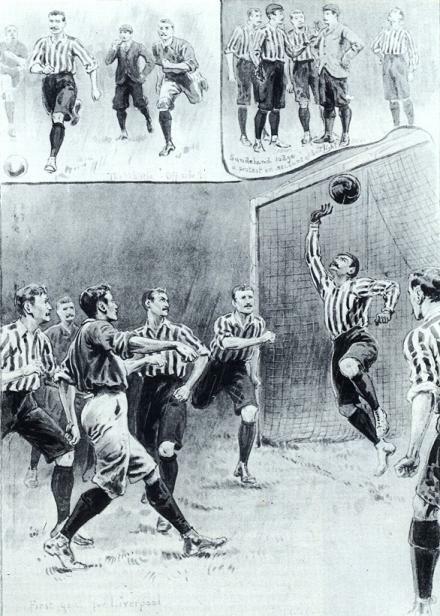 In the sketch in the right hand corner, Sunderland keeper, Ned Doig, who later joined Liverpool, protests "on account of bad light", clearly feeling the match conditions were less than ideal..
Liverpool played league champions and current leaders Aston Villa on Christmas Day "in one of the finest and hardest fought games on the Anfield enclosure." "The game became fast from the commencement, both ends being visited". Liverpool went two up but Villa managed to equalise before half-time. After an hour's play Allan headed towards goal and a Villa player tipped the ball over with his hand. Liverpool were awarded a penalty from which Becton scored. Liverpool lost Michael through injury and Villa equalised again against 10-man Liverpool. The result was a 3-3 draw where Liverpool "deserve every credit for the brilliant display, whilst the Villa are entitled equal commendation. As a game full of beautiful and intricate movements, dashing runs, and magnificent exchanges, the match will rank foremost for some time to come." Liverpool started 1897 by winning 4 out of their first 5 matches, the run coming to an end in their biggest defeat of the season, humiliation vs. Stoke City 1-6 at Victoria ground where Liverpool were no less than "outclassed, outmanoeuvred and overwhelmingly outplayed at every point of the game." Villa and Liverpool faced each other in the semis only a week after a scoreless league draw at Villa Park. Villa proved much stronger on the day beating Liverpool 3-0. Villa went on to beat Everton 3-2 in the final and won the Championship as well this season. Liverpool and Tom Watson were however very satisfied with finishing fifth in the league, a big improvement on the club's sole season in the top flight when finishing bottom two years previously. 21-year-old George Allan had again been the forward star of the team, scoring 15 out of Liverpool's 46 league goals, quite a few of them "with terrific force." It was a big blow to Liverpool to lose their main forward when Allan moved back to Scotland in May 1897 to play for Celtic. Liverpool Mercury noted at the start of the 1894-95 season when the new main stand was opened that "it is rumoured that ere long, the end stands will be covered over, so that, however bad the state of the weather may be, the spectators will be under proper cover." This came true certainly in the case of the Anfield Road end which was ready before the first game of the 1897-98 season at Anfield: "The new stand at the Anfield-road end is a decided improvement, and whilst affording shelter for the masses who weekly congregate in this part of the enclosure, harmonises splendidly with the long stand, which it resembles greatly in build, and at the same time appears to give the ground a more compact and comfortable appearance." Liverpool Mercury felt optimistic for the season ahead: "The prospects of the Liverpool Football Club are also of the brightest character. A retrospective glance at the club's brief though rather chequered history shows that there has been, even when labouring under the most gloomy conditions, an ardent spirit pervading the club that knew not suppression, and with the majority of the old executive officers in command, it requires but the loyalty of the team to bring about the magnificent successes of the past." The first highlight of the season was the clash between Liverpool and Everton at Anfield on 25th of September. Liverpool had so far failed to beat Everton in four league games and only succeeded against them in their first ever battle in the final of the Liverpool Senior Cup four and a half years ago at Bootle. "Never in the history of local football has the Anfield enclosure presented such a magnificent appearance as was the case on Saturday, when the two premier teams of the city met to decide the first of this year's League engagements. Though the allotted space around the playing arena served for a time its purpose of restraining the surging multitude, which momentarily increased at a tremendous rate, the barriers, altogether too frail for their purpose, were eventually brushed aside in two separate instances as if they had been tissue paper. It was a well-mannered, good-tempered crowd, however, and with the assistance of a strong posse of police order was quickly restored, the invaders being allowed to squat along the touchline. Other individuals who patronised the new stand were greatly tempted by the smooth iron supports to mount to higher points of vantage, and their struggles to attain what might be termed a bird's eye view furnished tremendous amusement of the crowd, roars of applause greeting the success of the fortunate ones." 30,000 spectators occupied all corners of the field on a beautiful sunny day. Everton took the lead after 23 minutes but held on only for seven minutes when Walker equalised after Cunliffe's attempt was charged down. Walker met the rebound "and banged the ball into the net with terrific force." Shortly after McQue added another for Liverpool with a long range shot that "rather easily beat McFarlane." Becton finished off Everton in the second half with a good header. Liverpool's first league victory over Everton had finally been accomplished. Liverpool's defence was singled out for special praise for its contribution to the victory over Everton: "The most distinguishing feature of the Liverpool display was the excellent work of the backs. The halves were always on the ball, and they initiated a stubborn defence, which was backed up by equally clever work from Goldie and Wilkie, to be finally clenched by a grand performance on the part of Storer, the whole forming one of the finest defensive displays given by the Liverpudlians for many a day." There was quite a reversal of fortune three weeks later when the Merseyside derby took place at Goodison Park. Everton won convincingly 3-0 in a game which was not played in as impressive a manner as the Anfield one as ugly incidents put their mark on the first half: "At occasional intervals there was more kicking of the man than of the ball. Everton were the chief offenders in this respect, and although the majority of fouls awarded were against them, and deservedly so, the referee might have easily added many more, and some reprehensible bits of work passed unnoticed. In the first minute almost Meechan lashed out at Bradshaw, the left-winger fortunately dodging the base attack, whilst later McCartney managed to avoid the referee's eye with a similar bit of work." As showing the importance of home support, these two different results from the Merseyside derbies were reflective of Liverpool's inconsistency this season. They never got a good run together and finished a disappointing 9th compared to 5th the previous season and with five less points. Alex Raisbeck was Liverpool's first superstar! 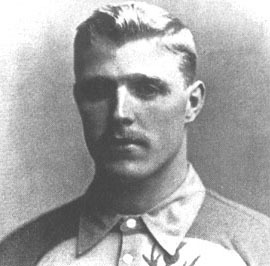 Tom Watson needed a leader for the team and he certainly got that in 19-year-old Alex Raisbeck who was signed from Edinburgh Hibernians on 6th of May 1898 after impressing Tom Watson while on 9 weeks loan at Stoke for the test matches. Raisbeck was a commanding centre-half whose timing and athleticism enabled him to reach the ball before taller opponents. Raisbeck was an inspirational figure in Liverpool's defence for just over a decade and the club's first ever superstar. He was so plauded by Liverpool Echo's Bee: "A man of Raisbeck's proportions, style and carriage would rivet attention anywhere. He was a picture at five feet nine inches and fully 12 and a half stone; a fine and beautifully balanced figure." 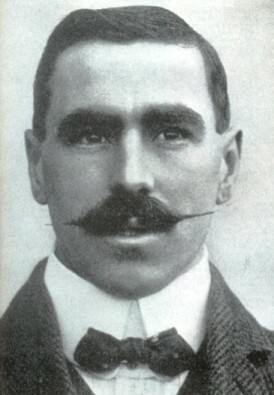 Watson like his predecessor McKenna strengthened the team with Scottish players. He resigned goalscorer supreme George Allan from Celtic and on 30th of March 1898 completed the double Hearts capture of right winger Tom Robertson and forward John Walker. Robertson only missed a single league match over the next two seasons and had overall a very successful four years stay at Liverpool, playing 141 games and scoring 34 goals. Walker also spent four years at Liverpool before returning to Hearts, scoring 31 goals in 120 games. 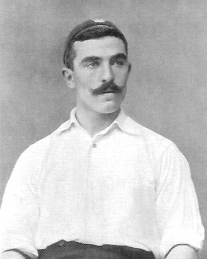 Another player that came into prominence in the 1898-1899 season was Liverpool born 20-year-old Jack Cox who had been signed in December 1897 from Blackpool. He was a tricky and speedy winger who contributed a high number of goals and is a true legend at the club, making 361 appearances and scoring 80 goals in his 12 years at Liverpool. Liverpool's most dramatic season in their 6 year history was ahead. Tom Watson had assembled a strong team that was ready to challenge for the title.